Competitive eating and food challenges is generally called dangerous, gluttonous, wasteful, unhealthy, and promoting obesity. This ignorance stems from the fact that people have very little knowledge, awareness, and understanding of the sport. When people are ignorant, they are quick to criticize and judge the sport and the people involved with it. We are here to change that, and need your help!! Currently, the eating community is not really taken very seriously by the general public, and one of the reasons why is because we are not taking ourselves seriously enough. 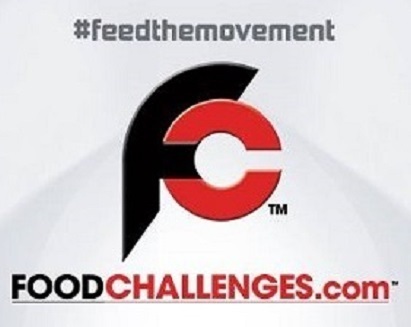 We are going to lead Team #FeedTheMovement and create a “movement” which will significantly increase the public awareness, general popularity, and social acceptance of competitive eating and food challenges. By doing this, we will “move” our sport up to a similar platform that mixed martial arts, boxing, racing, poker, bodybuilding, powerlifting, bowling, pool, darts, and other smaller mainstream activities are currently on. This “movement” will lead to more eaters, promoters, fans, and sponsors, which will then lead to more challenges, contests, and other competitions. Because of the much larger and more active community that we will continually grow, there will be many more & larger financial, marketing, and advertising opportunities for eaters, promoters, and sponsors alike. There will also be many more events for competitive eating fans to watch, follow, and enjoy. We are going to make this happen by educating people about the sport and by bringing the competitive eating community together with one united purpose. Before we describe how YOU can help, first we must identify 6 major issues that currently exist within our community. By identifying them upfront, we can continue forward with a better understanding of what needs to be corrected, and work together to improve the image of our sport, teach others to love it, and expand our community more easily while also promoting healthy lifestyles too. 1. Nobody is teaching or helping amateur eaters – You can use the internet to find out how to do just about everything, but until FoodChallenges.com was developed, there has been no reliable source that people can turn to for information regarding how to train for competitions, how to strategize for competitions, or even where to find the competitions to participate in. Therefore, most people competing in local food challenges and eating contests have no idea what they are doing, and it is next to impossible to want to continue doing something if you don’t even know how to get better at it. FoodChallenges.com will fix this problem using the now over 100 different articles teaching beginners about eating competitions and how to train and strategize so that they can dominate them. Eaters are also able to find all of the different food challenges around the world. Eventually, we will promote eating contests too!! Knowledge is power, and we will most definitely promote and teach that. 2. Nobody is teaching restaurants how to host and promote eating competitions – As mentioned in Man v Food’s Effect On The Restaurant World, the hit series sparked a massive increase in food challenges and eating contests, but it never taught any of the restaurants how to create, host, or market a food challenge. There are many factors that need to be considered when developing a food challenge that most restaurant owners never consider when designing their challenge. You cannot just throw 4.5 lbs (2 kg) of food on a plate and expect people to want to challenge it. Because of this lack of knowledge, most restaurant challenges significantly under-perform their marketing potential, and many of them are ended eventually due to lack of participation. This same theory also applies to restaurants and companies hosting eating contests too. FoodChallenges.com has over sixty very informative articles teaching restaurant owners and marketers how to design and promote their food challenge(s). Soon, we will have a section teaching promoters how to host eating contests too. 3. There is no real sense of “community” – There are competitive eating fans all over the world and there are eating competitions held in over 23 countries, but there is currently no centralized and globally accepted location that unifies any of these eaters and fans together. The only sources existing for eaters, fans, and promoters to interact is social media and Eatfeats.com. So far, none of those sources have created the solid community that could be leveraged to attract sponsors for the sport. For instance, on Eatfeats.com the site administrator allows “anonymous” comments. Because of that, most forums and places to interact on the site are filled with hateful and negative remarks. Nobody wants to join a community full of hate and negativity, and current members aren’t encouraged to interact either, so therefore that community has more negative effects than positive ones. FoodChallenges.com is going to become the best source to go to for eating information and interaction, and our social media will be the best source to follow for eating news and updates. We will then be able to use the community as leverage to attract sponsors so that more events and opportunities can be created for everyone involved. One unified and focused group of people working together with one common goal will be much more powerful than having many different separate groups operating very ineffectively by themselves. 4. Many eaters practice disgusting eating techniques – As mentioned in Dunking: The Steroids Of Competitive Eating, the hit television series Man v Food would never have become popular if host Adam Richman ate really sloppy and made a mess of the food he was eating. He always made the food look delicious and enjoyable, and that is one of the reasons that people watched the show. Many competitive eaters today worry mostly about the their time & speed rather than focusing on speed eating while still enjoying the food and making people feel like the food being eaten actually tastes good. This theory can be summed up by a social media comment on another eater’s video which stated, “Stopped watching when he stuck his hands in it.” That short and simple comment sums up this massive problem that the sport of competitive eating faces, and that is the fact that people don’t want to watch a bunch of sloppy people stuff their face in a disgusting manner. The burrito in the video referenced could have easily been neatly eaten with utensils just as quickly, but the eater chose to use his hands which made the eater very gross to watch. While speed eating in a very messy manner may attract a few social media views, that definitely will not attract actual television coverage and sponsors. The competitive eating community must become more family oriented. Eaters getting food all over the place has the same effect as if a fighter got cut really bad during a fight and began bleeding everywhere. Some people will still watch, but many people will turn away or turn it off entirely. The sport of competitive eating and food challenges will never grow if most people are not intrigued to watch & follow it. Therefore, eaters must begin using better manners. 5. Current eating organizations do not make use of social media – The top two eating organizations are Major League Eating and All Pro Eating. Both organizations operate basically the same way that they did in 2003 before Facebook and other social media platforms were established. Because of this, they are missing out on a large number of potential fans by not upgrading to today’s capabilities. Additionally, they do not produce videos of their events that can be shared online. That also means that a huge portion of potential eating fans are lost. Every year, over 1 million people watch the Nathan’s 4th of July Hot Dog Contest featured on ESPN. This shows that many people are interested in following our sport, but they only get to watch 1 event per year. There may be only 1,000 people watching a contest in person, but there are hundreds of thousands of people who are very interested in watching it online via their computer. Many people don’t even know they are “would be” fans of competitive eating because the opportunity to follow the sport has never been presented to them. In this social media world, FoodChallenges.com is going to be a game changer!! We will make full use of social media to the advantage of the eating community. We will be the destination for the latest eating news, photos, videos, tips, events, and results. The more fans and followers we have, the more interested sponsors will become, and that is when the more marketable events will begin to emerge. We are creating an expanding community of eaters, promoters, and fans who will all work together to make our sport HUGE worldwide and globally accepted. 6. We are not attracting new eaters, sponsors, and fans – In the business world, if you are not growing, you are dying. Since there is limited use of social media marketing, there has been no source to go to for eating tips and advice, and the fact that there is no real sense of a positive & encouraging community among eaters, very few new people are entering into the world of competitive eating and food challenges. Major eating contests are being discontinued each and every year, the boom in restaurant challenges has all but stopped, and prize money from sponsors is decreasing too. Since these conditions are occurring, and there are also very few new events popping up, it is extremely safe to say that the world of competitive eating is dying rather than growing. FoodChallenges.com is going to change that and eventually turn things around so that we can create a positive and growing community dedicated to increasing the awareness and improving the attitude among the general population regarding competitive eating and food challenges. Our goal is to create a new image for competitive eating that is similar to poker. They are both activities that anyone can compete and participate in!! This brand will successfully grow our sport and create opportunities for everyone in the community all over the world. The non-eating activities mentioned at the top including fighting, poker, and racing are all generally accepted activities because so many people follow and are involved with each activity. Money and BIG sponsors follow wherever the crowds are. There are hundreds of thousands of people playing poker at any given moment around the world, and there are also tons of people racing and fighting too. Millions of people watch different poker events, fights, and races each year both on television and online. Many people also create poker, fighting, and racing videos so that other people can watch and follow them via social media. Because of that, these are all BILLION dollar businesses!! We definitely cannot say the same for the sport of competitive eating. There are hundreds of eating contests, over 3,000 food challenges, and hundreds of thousands of people participating in different competitive eating events each year around the world. There are millions of people watching food challenge and eating contest videos around the world on both television and online too. The problem is that there is no unity at all among members of the eating community, and that is why the top eaters cannot even pay for the taxes of the average professional fighters, racers, and poker players. It is time to start really taking competitive eating seriously so that we can create new & better opportunities for everyone in our community.